When I was formally diagnosed in 2007, my own version of an FDA-approved-medication trivia game began. It was a mash up of “drug tic-tac-toe” & “side effect roulette”. If my years of experimentation can help one person reading this, it was all worth it! This is my experience, but is in no way a manual. My hope is that it can maybe give you, or someone you love, an idea of what to expect with each Rx. Before you start on this journey, or if you are already on it, hit pause and have a sit down with your doctor. Ask for an appointment in their office, not in an exam room. It seems like a small technicality, but it sets the stage for the conversation, while removing the vulnerability of being half naked in an open-backed gown. At this point let your physician know that you want to start the trial and error process of figuring out what medications will help you to have the best quality of life. I was lucky enough to have a ROCK STAR NEUROLOGIST who had initiated this conversation with me. He explained, in no uncertain terms, that it would be a long road ahead, but that we would do this together as a team. Slowly, one at a time, and under a doctor’s supervision, I tapered myself off of most of them. Personally, I can say that I am all the better for it. However, one of the tricky aspects of this stupid illness is that there is no one medication list, dosage, or regimen that acts as a standard treatment for everyone. It presents itself so differently in each one of us. It also depends where you live, how the weather effects your pain, your age and weight, etc. (For example, the low pressure systems in Southern California have increased my pain significantly, compared to when I was living in Southern Florida.) Also, this is also not a complete list of the medications I’ve taken over the years. If there is one in specific you’d like to know my experience with, go ahead and ask me in the comments or private message me. 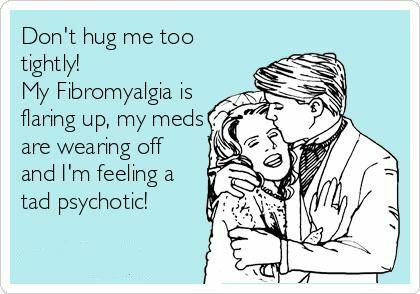 Let me also say that I don’t believe that living with Fibromyalgia WITHOUT ANY medications is realistic, nor necessary. So don’t feel guilty that you take medications. I’ve seen so many blogs, web sites, and “health supplement companies” say that someone was “cured of Fibromyalgia” with a juice cleanse, (or some other nonsense), so buy now for $99.99! Humph! Although healthy eating is of the utmost importance to us Fibros, just as it is to non-Fibros, cutting out all sugar for example, isn’t going to cure anyone of this illness. Anyone who claims that it (or anything similar) will, is a…well, a charlatan. Pure and simple. There are no legitimate medical studies to prove that diet can eliminate your symptoms or remove the illness all together. Click to go to Savella’s site. Let me tell you, this is some serious stuff! 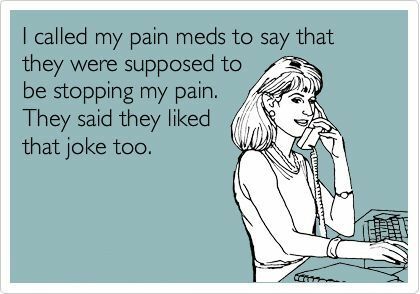 It can REALLY help with the pain, however after being on it for about 3 1/2 years, it wasn’t worth the side effects. The nausea the manufacturing pharmaceutical company describes in the list of side effects isn’t any ordinary nausea. It is more of a mouth watering, dizzying, fatiguing, turn of the stomach type of nausea. It felt as though I’d drank a half gallon of carbonated water, then immediately gone outside and jumped on a trampoline. They say you shouldn’t drink alcohol while taking it, and let me tell you, that is no joke! A measly 2oz of wine would make me feel so sick, as if I’d drunk the whole bottle. Within an hour or so I’d then start to feel a “hangover”, including the dehydration, exhaustion, and headache. Although drinking is not on the top of the list of things I worried about having to give up, it was still disappointing. But the truth is that the daily nausea that came with each dose no matter how much I ate ahead of time, was disabling. I’d have to make plans around taking each dose, carefully planning to not be around friends or family when the serious queasiness kicked in. It was truly an imposition on my day to day living and socializing. It had to go. Click to see Pfizer’s site. I still take Lyrica once a day. I started off, back in 2008, taking 100 mgs twice a day, but found that the morning dose would make me even more foggy during the day than usual. It was the drowsiness side effect that is one of it’s most common. After speaking with my Doc about it, we decided to try to cut out that morning dose because I could mentally manage the daytime pain. But at night I continue to take 100mgs, using the drowsiness to my advantage, helping me to fall asleep. 99% of the time I stick to the 100mgs, once day at night time. However, if I am having a particularly bad pain day, specifically in my legs, I’ll add in a 50mg capsule. Never more than a total of 150mgs. I don’t do that often because the next day, I often still feel drugged from it. Being that I was in my early 20’s at the time I began taking Lyrica, the weight gain so often reported by other patients was of great concern to me. My doc assured me that if I stayed at a low dose such as 100-250 mgs a day, that I would avoid that pleasent side effect. So far, in the last 7 years or so of taking it, I’ve had no weight gain… well not from Lyrica! The good effects of this drug don’t last in your system terribly long, but before taking it my leg pain was unbearable. When I say leg pain, imagine how your legs feel when they fall asleep. Now, imagine when you first start to move your leg because you know its the only way to bring the feeling back. That “pins and needles” feeling that makes the hair on the back of your neck stand up… THAT is what my leg pain feels like. That’s why I decided to stay on the low dosage of this medication. I’d never sleep if it wasn’t for the help from this drug. When I was having crazy migraines, a headache specialist tried to increase my dosage of Lyrica because it has been known to help Fibros with Migraines. Instead, I was a walking zombie. I was so tired, even worse than the average fatigue with this illness. I decided I needed to go a different route to dealing with the debilitating Migraines. So, the headache specialist decided to put me on Zomig for the migraines. Although it truly did help when I couldn’t fight the migraines, its a dangerous drug. You can’t take it more than twice per week. For me, that was scary. Really scary. When we moved to Florida, the headaches began to subside. They were at their worst when we were living in San Francisco, so I think that the weather and constant changes in the barometric pressure were to blame for them. When we have low pressure storms herein So. Cal, I am still prone to getting them. So knowing that, I just try to lay off the computer, stretch a whole lot more, and pay attention to my head. I haven’t taken it in almost three years now. One of the biggest issues with Fibromyalgia is our fatigue due to lack of real restful sleep. Back in 2007 I was prescribed Lunesta. In my mind, this is also a dangerous drug. Its highly addictive, super expensive, and tastes like rotten food. YOU HAVE NO IDEA HOW HORRIBLE IT TASTES! The problem that finally made me decide to stop taking it was that it stays in your system for much longer than 12 hours. Yes, I’d sleep at night, but I’d also sleep in the morning, the early afternoon, and be a zombie the rest of the day until I had to take it again. I began to fear that my body didn’t know how to sleep without it. Then I realized, my body wasn’t sleeping WITH it. It took me a while to taper off of it, and I was up for days once Iw as fully off of it, but its gone! Now, I use LIQUID melatonin. It comes with a little dropper, and you’d laugh at the amount I take. Its smaller than a kids dose. But with Fibromyalgia comes chemical sensitivity. So, its more than enough. It can be hard to wake up in the morning, but once I’m up, I don’t feel groggy like I did with Lunesta, Nyquil, or a night without sleep. Inevitably, there are going to be days, or sometimes weeks, that epitomize this illness. Times when the pain is so unbearable you wish you could just cut it out like an infection. Sitting still can be impossible, all while moving is just as painful. Being touched can make your skin feel like its covered in a layer of fiber-glass, while your muscles beg to be massaged. Its a true juxtaposition. So on those REALLY bad days, or when I go for a couple of weeks in a flare that won’t subside, I take 1/2 of a 250mg Soma, which is 125mgs. Soma is a muscle relaxer, so it will make me loopy and quite drowsy for a couple of days. I don’t like to feel “high” or “drunk”, so I only take it when I can’t handle the pain anymore. I try not to take it more often than MAYBE 2x a month because it is again, highly addictive. I have been fortunate enough to not have a substance abuse problem with all of these highly addictive medications, mostly because you have to enjoy the way they make you feel in order to take them more often than I do. However, I believe in never saying never, and I always proceed with immense caution. So, that brings me to Tramadol, my saving grace. This is the generic for the more commonly known, Ultram. This drug has been around a long time and is a NON-Narcotic pain medication. I take it serveral times a day, and I can’t tell you how much it helps. Again, it isn’t long lasting, but its one of the few things that help like clockwork. Just don’t take it too close to bed time because it gives you a bit of mental energy and you won’t go to sleep. Don’t get me wrong, I still feel the pain, but it is so much more manageable. So, those are the highlights of my long road down the prescription highway. What has your experience been? I’d love to hear what your take on some, or all of these medications in relation to your Fibromyalgia. Feel free to add your comments below! Chicken and Okra Gumbo, Made by a Cali-Girl! Tamale Cupcakes, a meal to go! Tramadol is the only drug for Fibromyalgia I can take because of conflicts with other conditions I have and I’m also a poor metaboliser so can get much higher levels of drug in my system than expected, so get knocked sideways by side effects. I have Tramadol MR, which is the sustained release version. I usually take it twice a day. I do take it at night and it hasn’t interfered with my sleep. I tend to under dose so I have some spare I can take in the middle of the day, or night. I really don’t like to take more than 100mg at a time as it makes me feel drowsy. I’ve recently been given a TENS machine to try by my physio and that helps with the pain when I truly desperate. It sounds like you do as many other #Spoonies do. We’ve learn over time that trial and error is our best path to success. Even then, different days call for different dosages etc. I think those of us who’ve had our illnesses for a long time also have “emergency kits”, for those days that are just unbearable. It can consist of ice packs, muscle relaxers or other meds that we can’t take on a regular basis because of the side effects, heating pads, etc. How did you come to using a TENS machine? What part of your body do you feels its most helpful? Hi, yes I’ve had the diagnosis of Fibromyalgia for 15 years now. My emergency kit is being able to take extra Tramadol, to which I add in paracetamol which seems to up the power of Tramadol. I also add in Ibuprofen, but I can only do that for a day or two and ensure I always have a full stomach when taking it as I don’t tolerate NSAIDS very well at all. I use a hot water bottle, cold flannels, self massage, relaxation techniques and various different herbs and herbal tinctures, depending on the symptom. An epsom salts bath is good, but I often can’t manage one, so I have a foot soak instead. I’ve got a few hypnosis apps that I find useful. I’ve chanced upon a combo that has helped improve my sleep, Magnolia bark extract, Valerian extract & Hops. I also use an Arnica massage balm from Weleda along with comfrey cream when the pain is bad. It’s taken me a long time to find suitable things. Even natural remedies can be problematic for people who are also Bipolar. Oh, cramp brake tincture is amazing for menstrual cramps and IBS gut spasms. Weirdly it gave me heartburn when I was using too low a dose. I started using a TENS machine as I was referred to physio as I’ve had a long period of being mainly stuck in bed. Physio thought a TENS machine might help with pain management as I’ve had some very severe episodes which just weren’t manageable. So she’s loaned me one to try. It works quite well with the most severe pain. There is some evidence that using pulsed signals from a TENS unit may help the brain release pain killing chemicals, rather than using a continuous signal. It’s very individual, so I’ve been experimenting with mine. Aside from Tramadol, and the 3 herbs I take for sleep, I don’t use the above all the the time, just when the need arises. My mother has fibro so reading this is insightful. She’s found some relief with Cymbalta, but nothing to write home about. Seeing her in pain, I know it must be very hard for you. Thanks for sharing your experiences and I hope you can find treatment that helps you ease your symptoms. Ideally, I hope for a cure. Stay strong! I’m so glad this was helpful. I am also so happy that your mother has a support system in you. That is the closest thing to a cure any of us “Fibros” can have. Thank you for your kind words, and good luck to you and your Mamma!